There are numerous reasons affluent investors use robo-advisors rather than use human advisors. The fees robo-advisors charge are lower than human advisor fees, robo services are easy to use and require less time than meeting with personal advisors, and robos don’t use pressure tactics that human advisors might employ. But the concept that robo-advisors can perform the duties of a financial advisor better than a human advisor? That takes some convincing. Apparently, many investors are convinced. Spectrem’s newest research into the use of robo-advisors – Wealthy Investors and their Perceptions of Robo-Advisors – lists a number of financial and investment actions a robo-advisor can perform, and asks investors whether the robo-advisor can do that particular task as well as a human. The answer is often “yes”, and sometimes the answer is “the robo-advisor can do a better job”. This reaction is perhaps only a perception. But with the perception comes the reality that affluent investors are using robo-advisors, and some are using them as their primary advisor. In the Spectrem study, investors were segmented by whether they have used a robo-advisor or not. Investors who have not used a robo-advisor were less likely to state that robos can perform any task as well as a human advisor, although even then there were some who gave robo-advisors credit for preforming functions accordingly. Starting at the high end for robo-advisors, 30 percent of investors who use robo-advisors believe the automated system can do a better job of picking stocks to match an investor’s risk tolerance than a human advisor. While more 40 percent still selected the human, having 30 percent who think the robo-advisor is better is not only an assessment of the viability of technology-based stock market advice, it is a condemnation of sorts on the job human advisors do picking stocks against an investor’s risk tolerance. Where does this attitude against human advisors stem from? Similar questions were asked about selecting retirement plan investments (28 percent said the robo could outdo the human), adjusting investments for life changes (23 percent for robos), and establishing a financial plan (11 percent). 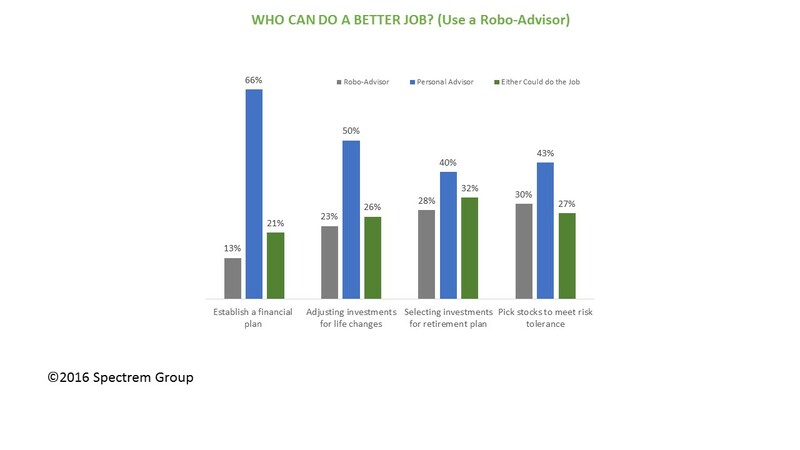 The percentages in favor of robos by investors who do not use robo-advisors were much lower, but even then, 11 percent of investors said a robo-advisor could do a better job of matching stock picks to an investor’s risk tolerance than a human advisor. Are these opinions just those of the younger generation of investors who are comfortable with algorithm-based information and technology-based advice? In the case of picking stocks to meet risk tolerance, the answer is “no”. The study segmented robo-users into four age groups in the study, and three of the four gave robos at least 30 percent agreement that they could do a better job than humans. Among non-robo users, 39 percent of investors 45 years of age and younger agreed that robo-advisors could do the job as well as human advisors. Even among the oldest segment (62 and older), 27 percent agreed a robo-advisor could do the job of stock selection as well as a human. The point of this set of insights is that robo-advisors are not only gaining clients because of ease of use and perceived cost benefits, but also because it is perceived they can do certain jobs better than humans. As that perception grows, so will robo-advisor business. Many large financial providers have include technology-based advisory services as part of their overall program, but still must maintain and promote those occasions when a human advisor is preferable to a machine. While humans will undoubtedly maintain clientele among investors who do not trust technology, that audience is going to decrease daily, and humans must find a way to provide assistance and advice investors cannot get from automated platforms.